This beginner pattern has LOTS of options! 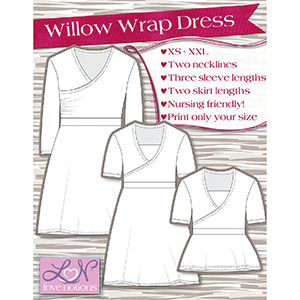 They are super comfortable with no seam down the back and can be made with a no exposed The Willow Wrap Dress is functional, flattering and comfortable made with knit fabrics. The crossover neckline can be made lower to make access easier for those nursing mamas. Add the optional modesty panel to give a layered look. The side ruching can be made with gathers or pleats and knee length full a-line skirt is so flattering on all figures! 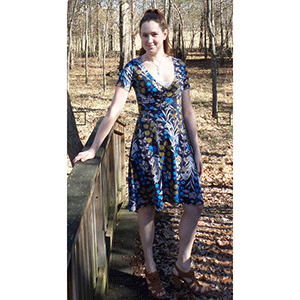 The dress can also be made without the ruching for a smooth finish. Both styles can be done with a peplum skirt inseam of a full length skirt. Suggested fabrics are cotton lycra, ponte de roma, and cotton jersey.